This article is about the ancient city. 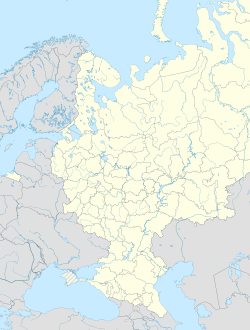 For the river named Tanais in classical antiquity, see Don River (Russia). For the crustacean, see Tanais (genus). Tanais (Greek: Τάναϊς Tánaïs; Russian: Танаис) was an ancient Greek city in the Don river delta, called the Maeotian marshes in classical antiquity. It was a bishopric as Tana and remains a Latin Catholic titular see as Tanais. The delta reaches into the northeasternmost part of the Sea of Azov, which the Ancient Greeks called Lake Maeotis. 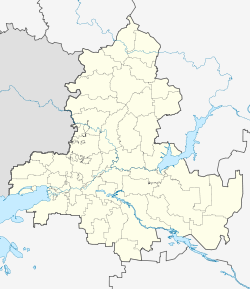 The site of ancient Tanais is about 30 km west of modern Rostov-on-Don. The central city site lies on a plateau with a difference up to 20 m in elevation in the south. It is bordered by a natural valley to the east, and an artificial ditch to the west. The site of Tanais was occupied long before the Milesians founded an emporium there. A necropolis of over 300 burial kurgans near the ancient city shows that the site had already been occupied since the Bronze Age, and that kurgan burials continued through Greek and into even Roman times. The Tanais (Don) River, the Greek colony of the same name and other Greek colonies along the north coast of the Black Sea. Greek traders seem to have been meeting nomads in the district as early as the 7th century BC without a formal, permanent settlement. Greek colonies had two kinds of origins, apoikiai of citizens from the mother city-state, and emporia, which were strictly trading stations. Founded late in the 3rd century BC, by merchant adventurers from Miletus, Tanais quickly developed into an emporium at the farthest northeastern extension of the Hellenic cultural sphere. It was a natural post, first for the trade of the steppes reaching away eastwards in an unbroken grass sea to the Altai, the Scythian Holy Land, second for the trade of the Black Sea, ringed with Greek-dominated ports and entrepots, and third for trade from the impenetrable north, with furs and slaves brought down the Don. Strabo mentions Tanais in his Geography (11.2.2). The site for the city, ruled by an archon, was at the eastern edge of the territory of the kings of Bosporus. A major shift in social emphasis is represented in the archaeological site when the propylea gate that linked the port section with the agora was removed, and the open center of public life was occupied by a palatial dwelling in Roman times for the kings of Bosporus. For the first time there were client kings at Tanais: Sauromates (AD 175-211) and his son Rescuporides (c. AD 220), who both left public inscriptions. In AD 330 Tanais was devastated by the Goths, but the site was occupied continuously up to the second half of the 5th century AD. Increasingly, the channel silted up, probably the result of deforestation, and the center of active life shifted, perhaps to the small city of Azov, halfway to Rostov. The city was refounded around the 13th century by the Venetians. Later it was acquired by the maritime Republic of Genoa, who administered it 1332-1471 as Tana nel Mare Maggiore, being an important place for trade with the Golden Horde, like all their Black Sea colonies controlled by the Genoese Consul at Kaffa. It decayed again after 1368. In 1392 it was conquered by Timur, by the Ottoman Turks in 1471, by the Russians in 1696, again by the Turks in 1711 and by the Russian Empire in 1771. Circa 1300, under Venetian rule, was established a Diocese of Tana as territory not previously served, maintained under Genua. Most bishops were members of two major and missionary orders. It was exempt, i.e. directly subject to the Holy See, not part of any ecclesiastical province. In 1471, under Ottoman Muslim control, the bishopric was suppressed. In 1925 the diocese was nominally restored as Latin titular bishopric of Tana, which from 1929 was called Tanais (exclusively from 1942). In 1823, I.A. Stempkovsky first made a connection between the visible archaeological remains, which were mostly Roman in date, and the "Tanais" mentioned in the ancient Greek sources. Systematic modern excavations began in 1955. A joint Russian-German team has recently been excavating at the site of Tanais, with the aim of revealing the heart of the city, the agora, and defining the extent of Hellenistic influence on the urbanism of the Bosporan Greek city, as well as studying defensive responses to the surrounding nomadic cultures. 9 Y-chromosome markers were obtained from a skeleton. The result was 389I=13, 389II=30, 458=15, 385=11, 393=13, 391=11, 635=23, 437=14, 448=19. This result is characteristic for haplogroup R1a. ^ Konrad Eubel, Hierarchia Catholica Medii Aevi, vol. 1, p. 471. ^ vol. 2, p. 245. ^ "The Population of Southern Russia Across the Ages (The Don Readings in Physical Anthropology): Collection of papers" (PDF). Russian academy of sciences. Crowley, Roger (2011). City of Fortune - How Venice Won and lost a Naval Empire (Hardback)|format= requires |url= (help). London: Faber and Faber. ISBN 978-0-571-24594-9. Konrad Eubel, Hierarchia Catholica Medii Aevi, vol. 1, p. 471; vol. 2, p.
Phanagoria was the largest ancient Greek city on the Taman peninsula, spread over two plateaus along the eastern shore of the Cimmerian Bosporus. 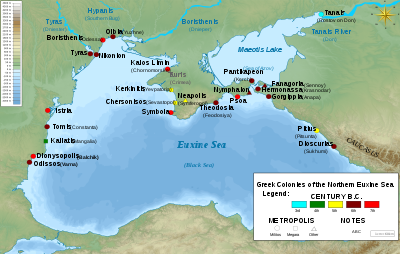 Cius, later renamed Prusias on the Sea after king Prusias I of Bithynia, was an ancient Greek city bordering the Propontis, in Bithynia, and had a long history, being mentioned by Aristotle, Strabo and Apollonius Rhodius. It was colonized by the Milesians and became a place of much commercial importance. It joined the Aetolian League, and was destroyed by Philip V of Macedon in the Second Macedonian War. It was rebuilt by Prusias I of Bithynia who renamed it for himself. An important chain in the ancient Silk Road, it became known as a wealthy town. Apollonia in Cyrenaica was founded by Greek colonists and became a significant commercial centre in the southern Mediterranean. It served as the harbour of Cyrene, 20 km (12 mi) to the southwest. Antiochia ad Cragum also known as Antiochetta or Latin: Antiochia Parva is an ancient Hellenistic city on Mount Cragus overlooking the Mediterranean coast, in the region of Cilicia, in Anatolia. In modern-day Turkey the site is encompassed in the village of Güneyköy, District of Gazipaşa, Antalya Province. Apamea Cibotus, Apamea ad Maeandrum, Apamea or Apameia was an ancient city in Anatolia founded in the 3rd century BC by Antiochus I Soter, who named it after his mother Apama. It was in Hellenistic Phrygia, but became part of the Roman province of Pisidia. It was near, but on lower ground than, Celaenae (Kelainai). Krbava is a historical region located in Mountainous Croatia and a former Catholic bishopric (1185–1460), precursor of the diocese of Modruš an present Latin titular see. Arycanda or Arykanda is an Ancient Lycian city, former bishopric and present Catholic titular see in Antalya Province in the Mediterranean Region of Turkey. Arykanda was built upon five large terraces ascending a mountain slope, located near the small village of Aykiriçay, presently on the Elmalı-Finike road. 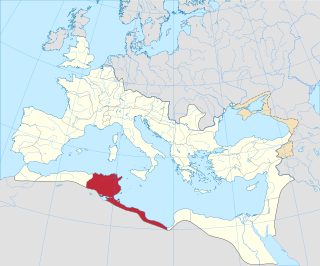 Blaundus was a Roman episcopal city in Asia Minor, presently Anatolia, and is now a Latin Catholic titular bishopric. Gunela was an ancient Roman-Berber town and archaeological site in Bizerte Governorate, Tunisia. It was located at 37.165524n, 9.765536e, within the suburbs of Tinja, Tunisia. Gunugus or Gunugu was a Berber and Carthaginian town in northwest Africa in antiquity. It passed into Roman control during the Punic Wars and was the site of a colony of veteran soldiers. It survived the Vandals and Byzantines but was destroyed during the Muslim invasion of the area.